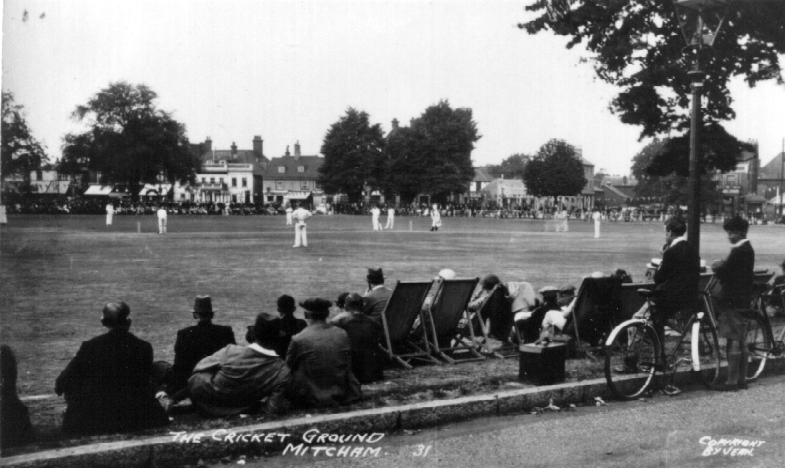 Cricket has been played on the Lower Green, Mitcham, for more than 300 years. The game became popular in Southeastern England in Restoration times and ‘Crickette on Ye Olde Meecham Green’ is reputed to have been shown in a print dated 1685. In 1707 a Mitcham team challenged All London to a match on Lamb’s Conduit Fields in Clerkenwell and in 1734 a match was reported between the ‘Gentlemen of London’ and those of Mitcham in Surrey. In 1813 and a number of times during the 1820s the Mitcham team played the Marylebone Cricket Club (MCC) team at Thomas Lord’s cricket ground in St John’s Wood. In 1845 when the Surrey County Cricket Club was established at The Oval, a Mitcham team played there also. James Sutherton, a Mitcham player and licensee of The Cricketers, played in the first Test Match in Melbourne in 1877 having two years previously run out W G Grace for 6 runs on Mitcham Green. The Australian team practised on Mitcham Green before the first Test Match in England in 1878 and returned in subsequent alternate years. Other Mitcham men who played for England include, in the early 20th century, Tom Richardson (fast bowler) and in the 1960s Ken Barrington (batsman). Mitcham Cricket Club is unusual in that its pavilion (built 1904) faces the Green but is separated from it by a busy road. Prior to its construction, players changed and were refreshed in local pubs such as The Cricketers and The Burn Bullock.